Heating the coolant directly with solar rays turns water into steam, which then turns the turbo-alternator to produce electricity. Device that uses steam to convert the mechanical force generated by the rotation of the turbine into electricity. Electricity is carried over vast distances by a network of cables that extends from the power plant to consumers. Device used to alter the electric voltage; the voltage is increased at the plant outlet in order to carry the current over long distances. Circuit that cools the steam from the turbine and condenses it into water, which is reintroduced into the steam generator. Device that uses heat to convert water into steam to activate the turbo-alternator. After releasing its heat to the steam generator, the cold coolant returns to the boiler. The coolant extracts heat from the boiler and carries it to the steam generator and turbine. Device that ensures that the cold coolant liquid flows to the boiler. The Sun emits waves in the form of luminous radiation (41% visible light, 52% infrared light and 7% ultraviolet light). Solar rays trapped by heliostats are sent to the boiler. Fluid (e.g., a mixture of melted salts) that traps the heat from concentrated solar radiation and carries it to the turbine. 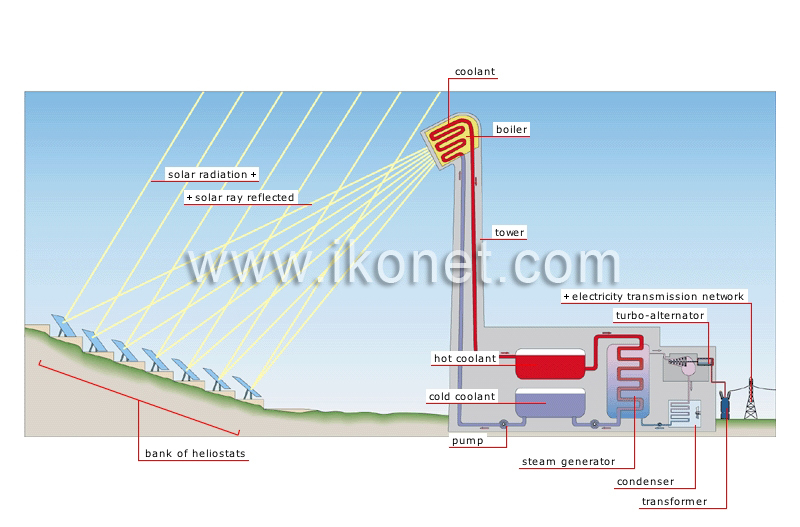 Structure atop which the boiler sits and collects luminous energy; it can reach 100 m in height. Enclosure in which the concentrated heat from the Sun’s rays raises the temperature of the coolant.